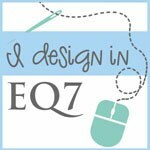 I can finally share with you the project that I have been working on for months. You may remember my pics on Facebook with the 2 1/4" friendship stars and the 5" stars. Well, here it is finished! I made this for the Wall Hanging competition at the Kutztown Folk Festival. The festival opens today. You can find more info here. This is the first year that I have entered their competition. They send you a certain fabric and you need to make your wall hanging using a good portion of this fabric. The competition fabric this year was a red paisley print. I really like paisley so I thought "Cool!" The wall hanging could be any shape but the combined total of all of the sides could not be less than 108" or more than 144". Of course, I came up with many ideas, but I had to decide on one. I actually asked my hubby for his favorite and he chose this one. 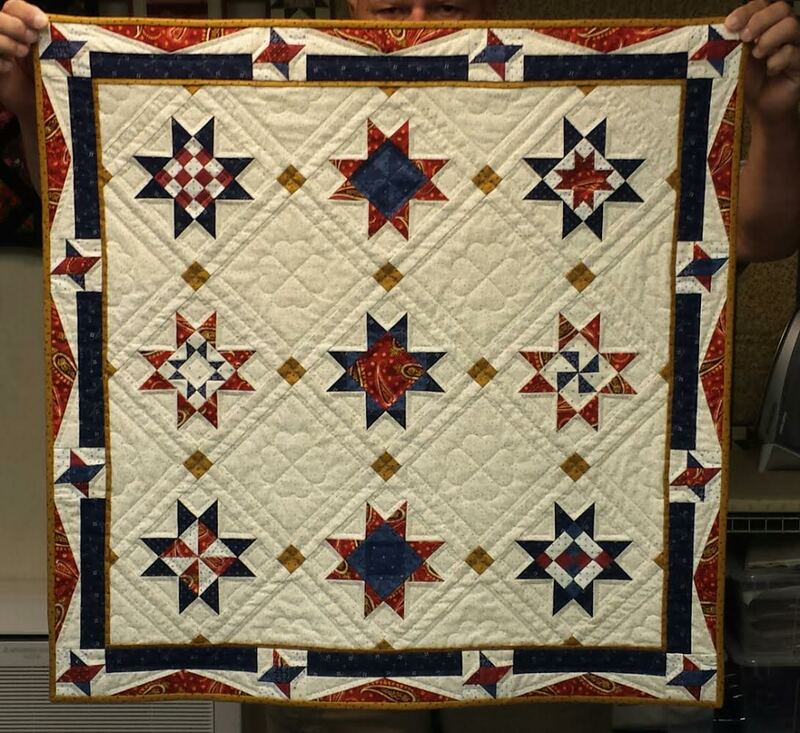 I had done a similar design for a shop hop quilt one year, but I did different stars and settings and shrunk everything! 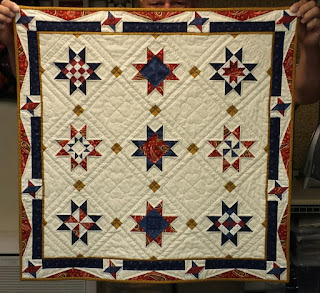 The finished quilt measures 30" square. Some of the pieces in the stars are 5/8" in size. I wanted to have the stars look like they were floating so I used the same fabric for the backgrounds, sashing and alternate blocks. I added a narrow flat piping of gold before the border and carried the gold through in the cornerstones of the sashing and the binding. I foundation paper pieced the red and cream part of the border sections. I machine quilted everything. 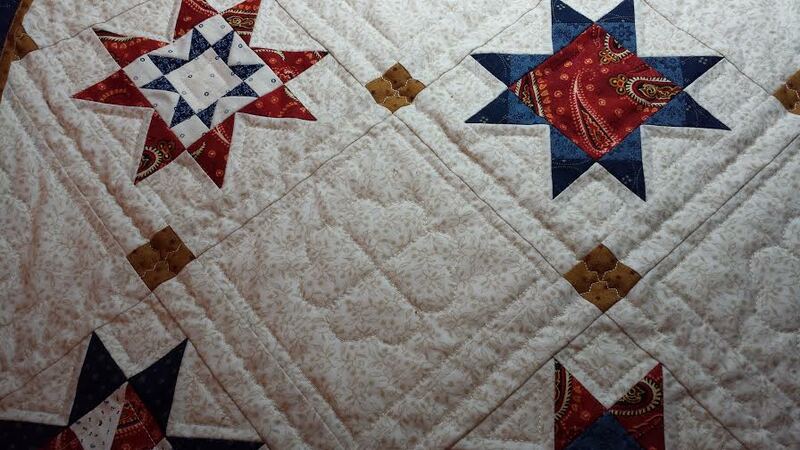 I was hoping to do hand quilting in the alternate blocks, but ran out of time. 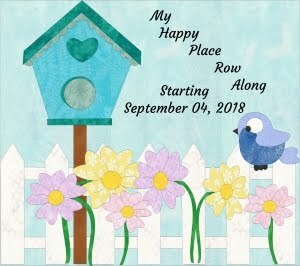 If you check out my Happy Sewing Room Facebook page you will find information as to how I did my quilting on the alternate blocks and also how I started and ended my quilting throughout the quilt. A little story about my binding. I only had a small amount of gold fabric left to use for the binding. I went ahead and cut my strips. I usually do a straight grain binding. However, after cutting my strips, I remembered reading in the competition rules, that we need to do bias binding. I thought, "OH NO!" How would I ever cut more strips from such a small amount left. Thank goodness for the internet. I did a search for bias binding and found a couple of sites that used a rectangle rather than a square piece of fabric to make their bias binding. And one of the sites was Bonnie K. Hunters' - quiltville.blogspot.com under the tips and techniques tab. Thank you, Bonnie! I had a piece 9" x 42" to make my bias binding from. It worked out beautifully! I did have a lot more seams, since it was a narrow piece, but it worked! Although I did not get one of the 3 prizes, I feel I am still a winner. I enjoyed the whole process of creating the quilt and being able to try some new things, that I may not have tried without this challenge. 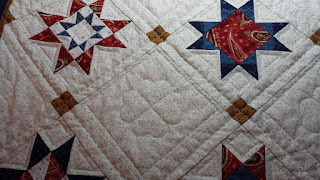 A close up of some quilting. A close up of the border. I hope to write a pattern for this wall hanging soon to sell on my store on craftsy.com. I will let you know when it is available.